We All Own the Monkey’s Selfie. A macaque monkey in Indonesia steals a photographer’s camera and then snaps a few selfies. Really, that happened. (See picture left). Sometime later, the photographer recovers his camera, publishes the selfies, and claims copyright ownership in the pictures. Enter Wikipedia, which copies the pictures and makes them available through its free, worldwide image repository. The photographer protests, claiming that Wikipedia is infringing his copyright in the pictures. So, has Wikipedia infringed the photographer’s copyright in the pictures? Not at all, says the U.S. Copyright Office. And I agree. In a 1200+ page report issued by the Copyright Officethis week, the U.S. government brought the issue into focus (pun intended) by declaring that a work can be protected by copyright only if the work is the “fruits of intellectual labor” that “are founded in the creative powers of the mind.” Moreover, the “mind” that does the “creating” must be a human mind; animal minds don’t count. 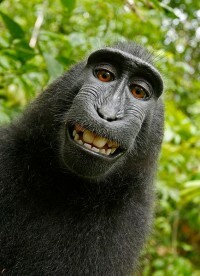 To illustrate its position, the Copyright Office specifically cited a “photograph taken by a monkey” as an example of a work that could not be copyrighted. So what happens to the pictures snapped by the monkey that were published by the photographer? Answer: they are in the public domain, and can be distributed, for free, by Wikipedia. And by you. And by me. This raises the question: how could the photographer have protected the pictures taken by the monkey? First, let’s separate this case from situations in which nature photographers purposely position cameras in certain outdoor locales. Here, the camera was stolen by the monkey, and the pictures were the serendipitous result of the monkey’s actions. The images were notthe product of any degree of creative thought by the photographer. Had the camera been purposely placed in a particular locale, the resulting images would have reflected the foresight and creativity of the photographer. But that didn’t happen. Instead, the monkey took control of the situation, and everything that occurred was the direct result of the monkey’s curiosity; the photographer had nothing to do with it. Next, let’s remember the number one maxim of copyright law, namely, ownership vests in the author of the work. (If you remember nothing else about Copyright Law, remember that.) In this situation, who “authored” the work? Answer: the monkey. The photographer simply acquired the digital image from the camera. He “authored” absolutely nothing. So, under U.S. law, the monkey owns the work because the monkey authored the work. Now, you may be thinking, “The picture was taken outside of the U.S.–so that changes things, right?” No, in most cases, it doesn’t. Neither the U.S. nor any other country that is a member of the Berne Convention (which governs international copyright issues among its 167 members) allows animals to own copyrighted works. So, in this case, the monkey has no rights, and the selfies are in the public domain. Back to my original question: what could the photographer have done to protect the pictures? Well, he could have transformed the pictures into something other than the selfie authored by the monkey. He could have enhanced the colors in an artistic manner, or applied filters to the picture to make the picture look like something other than the plain ol’ selfie snapped by the monkey. In short, he could have–and should have–done something original to the photograph, in which case he would have owned the photograph as modified by his own creative efforts. © 2019 Law Office of Bradley Gross, PA. All rights reserved.